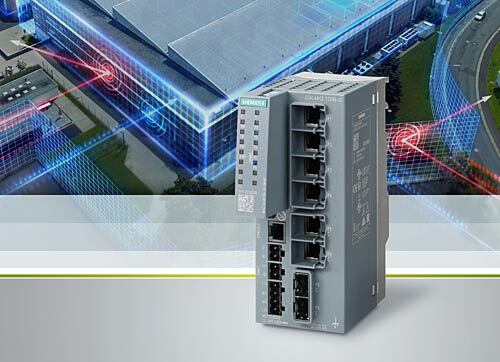 Siemens is extending its portfolio offering protection against attacks on software and hardware components at the industrial cell level: The new Scalance SC-600 Industrial Security Appliances have a firewall (Stateful Inspection Firewall) with a data throughput of up to 600 Megabits per second (Mbit/s). Depending on the variant users can also administer VPN tunnels up to 200 IPsec (Internet Protocol Security). Scalance SC-600 also provides convenient options for network structuring via virtual LANs (VLAN) and Network Address Translation (NAT/NAPT). The Scalance SC-600 is configured via the integral web server using the Simple Network Management Protocol (SNMP), Command Line Interface (CLI) or the Step 7 V15 engineering software (TIA Portal). For secured remote access, the new industrial security appliances can be connected via the Sinema Remote Connect management platform. The Scalance SC-600 are compact security network components, each with up to six RJ45 Ethernet ports which provide a data rate of up to 1 Gigabit per second (Gbit/s). Two of the six ports are also designed as combo ports. These allow integration of either optical 100 Mbit/s or 1 Gbit/s SFPs (Small Form-factor Pluggable) in single or multi-mode design. The combo ports can therefore bridge distances of up to 200 kilometres via FO cables with LC connection technology. The two combined RJ45 ports are deactivated in this mode. The Scalance SC-600 allows flexible configuration of security zones. Depending on the variant, either one port is dedicated to the overlapped network and one to the network to be secured or the six active ports can be split into different security zones if required. The design, which is based on the Simatic S7-1500 housing, enables space-saving installation in the control cabinet. The industrial security appliances come with a redundant 24-volt DC power supply as well as a signaling contact and can also be connected to the Sinema Server network management software. In addition to this, they are passed for Zone 2 hazardous areas as well as use in the shipbuilding industry and meet the IEC 62443 standard.